In the wake of this digital era, many believe that paper is dead. That we’ve got all the latest gadgets and hence can create, store, and share important documents in the digital format. Paper is still dominant in the business world. It is widely used to create presentations, annual reports, legal documents and more that are instrumental in many forms. Needless to say, a binding machine too becomes a necessity to bind loose papers together and craft professional-looking documents. You want new, skilled employees to join you, right? Well, giving them a sleek, well-bound company overview is a great idea to impress them in the first place. It’ll convey your brand ethos and company culture and leave a lasting impact. Won’t you want your new staff to know how your company functions? A well-presented and accurately written operational handbook helps someone unfamiliar know how you operate and how to take care of day-to-day procedures. Hyper-competitive era makes everything so exciting. If you are a visionary, we know you would see the thriving market competition as a way to find uncharted domains and invite growth, rather than a matter to stress about. Company with a great proposal presentation often enjoys an upper hand. If you are up with the right kind of binding machine to create proposal, you are likely to attract more business. It is a no-brainer that anything that is visually enthralling is loved more than whatever is kept as the option. With a binding machine handy in your work environment, you can create creative & informative brochures with ease. You can easily narrate your products or services and let prospective customers see what you’ve got for them. Any company that set goals, strategizes plans and sketches their course of action is likely to be a winning organization. To have a concrete internal business plan in the literal sense, you can choose to get all the important details bound and put together. Your business plan document will give you the push to execute the plans and realize your true potential. Preparation of tax returns is one of the most obvious uses of having a binding machine in the work environment. With a binding machine alongside, you can keep a clear and organized record of your tax returns. A good PowerPoint presentation has the power to turn everything in your favor. From existing clientele to prospects and investors to end customers, you can sum up some crucial information together in a presentation and give them solid reasons to like you. 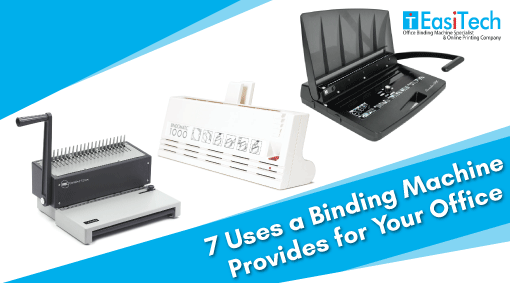 A binding machine can help you present well and earn a fair share of brownie points! We at EasiTech bring the best selection of manual and electric binding machine Malaysia. Explore our products and see if you find a machine that aligns with your business needs. How a binding cover hold 540 sheets of paper? Reasons Why Investing in a Comb Binding Machine is a Good Idea! Thermal Binding Machine or Tape Binding Machine- What Should You Buy?